Serenity—a perfect cozy cabin—you can be at the private lake in minutes and just 50 yards away from the Stanislaus Forest and only five minutes away from the grocery store. This location is perfect for winter or summer skiing, fishing and hiking. This is a great place to relax and get grounded and is a non-smoking, no pet cabin please. Maximum 8-10 guests. 5 Bedrooms, 3 Baths, 2600 sq. ft. – Cozy, clean and delightful tri-level home that includes 1 cal king, 4 queen beds and 1 air bed that has two TV's-1 flatscreen 3/DVD players and expanded cable and wi-fi. The great room downstairs has a wood burning stove, refrigerator, air hockey and fosball table, along with plenty of games, puzzles and DVD’s to watch. Bring your own sheets and towels or rent linens. There’s a great deck that overlooks an apple orchard with table/chairs and gas BBQ. Help yourself to horse shoes, bocce ball or badminton. The driveway is big enough to park your ski boat for spending the day at one of our nearby lakes such as New Melones or Tulloch. Catch a concert at Ironstone and get some wine tasting in at many of the fine wineries nestled in the mountains Take a hike and tour at Big Trees State Park. Arnold is located in the heart of the Ebbett’s Pass wonderland, Calaveras County in the beautiful Sierra Foothills Gold Country off of Highway 4 between historic Murphy's town and Bear Valley Ski Resort. It's a quick 2.5 hour drive from the bay area. 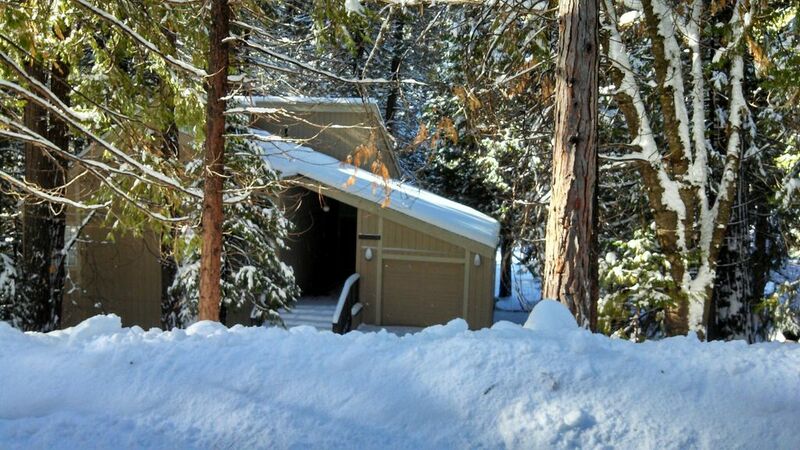 Experience the serenity and beauty of the mountains in Lakemont Pines, California. Check out this webcam and see the beautiful view for yourself! Lake Mont Pines WebCam.... Webcam Feed home-owners-assoc.com provides the fastest, easiest, and least expensive method for Homeowner Associations to build their own web sites for communicating with homeowners and managing the association. Plenty of DVDs to watch! Private lake access and 10 passes for swimming, paddle boats, kayaking and catch and release fishing. Loved two story style house. house is very outdated in a nice cute area. Neighbors are way too close. No dishwasher! Kitchen well supplied. Stove is from 1940ish. I would definitely stay here again! Location, amenities, and cleanliness were on point. If you’re looking for a place to stay, look no further.... this is the place to stay!!! We had a large group, 4 families with children. Pam was great to work with. This cabin had plenty of room for all of us. The game room downstairs was great for the kids to hang out in and play. Plenty of games , movies and WiFi!! The use of the lake was also awesome and we even enjoyed a nice evening stroll around the block. Highly recommend this place for a group. Thanks again Pam, we will be back again! This cabin was great. The kitchen was fully stocked of pots and pans. I loved how big the cabin was! There was more than enough room for my family of 10. The great room, downstairs was a great gathering space with games and movies! I would recommend this place! We had a pleasant stay in this beautiful cabin located near the lake. It is very spacious so that 10 people feel very comfortable. The downstairs is a fun entertainment & Game Center. This is our second year and would not hesitate to return. We would highly recommend staying here. Access to a private lake-- Lakemont Pines - we provide ID tags and parking passes that are required for beach access. CHECK THIS OUT!!! CALAVERAS COUNTY RANKED 14th out 3,111 Counties in the USA for having Extremely High Natural Amenities. Optional: linen rental fee $85.00 (sheets/towels) Rates are subject to change, especially during holidays.